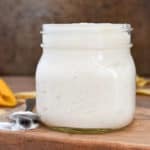 This Easy Vegan Tofu Sour Cream is much healthier than regular sour cream. Use as you would regular sour cream or as a dip for chips and veggies. 1–12 oz. box of firm or extra firm silken tofu. Place all ingredients in a blender and process until mixture is smooth and creamy.